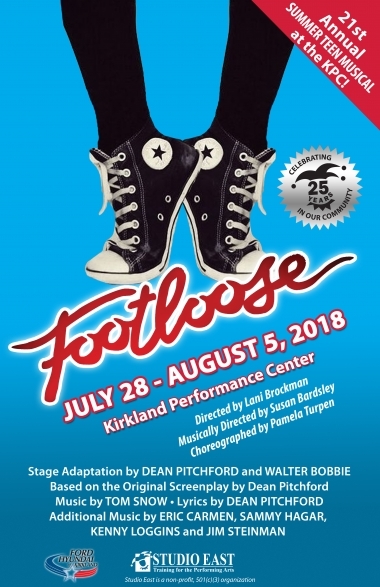 Studio East is excited to bring the hit musical Footloose to the stage this summer as its annual teen musical! Based on the 1984 film, this musical follows an eccentric teenager as he moves to a small middle-American town where dance is forbidden. He rallies a gang of friends to help him defy the town and create a true rock’n’roll prom. Stage Adaptation by Dean Pitchford and Walter Bobbie. Based on the Original Screenplay by Dean Pitchford. Music by Tom Snow and lyrics by Dean Pitchford, with additional Music by Eric Carmen, Sammy Hagar, Kenny Loggins, and Jim Steinman. 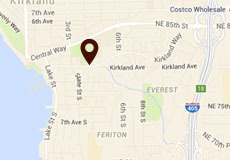 Studio East Training for the Performing Arts is proud to be a 501(c)3 nonprofit providing theater arts education and opportunities for children in Kirkland, WA and surrounding communities. Starting with one theater program for teens in 1992, Studio East has become one of the largest children’s theater training programs in the Seattle Metro area. Today, between the Studio’s camps and classes and its professional, adult touring arm, StoryBook Theater, Studio East serves over 70,000 people annually.